An engineered synchronously pumped picosecond optical parametric oscillator. Ultrafast laser radiation with picosecond (ps) duration in the 2-5 μm mid-infrared region plays a key role in many fields including material processing, time-domain spectroscopy, and biomedical applications. An optical parametric oscillator converts an input laser wave (called "pump") into two output waves of lower frequency by means of second-order nonlinear optical interaction. The two output waves are called "signal" and "idler", where the output wave with higher frequency is called signal. 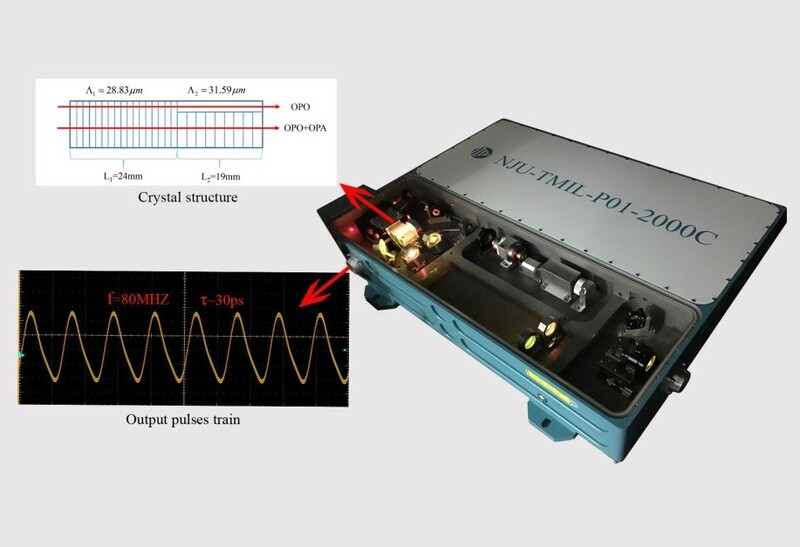 A synchronously pumped optical parametric oscillator (SPOPO) combined using a quasi-phase-matching (QPM) technique is a versatile method of generating tunable mid-infrared picosecond laser pulses. However, the pump-to-idler conversion efficiency decreases when the idler wavelength increases. The transmission of the light above 3.8 μm also decreases with the increase of the wavelength. The two factors stated above restrict the pump-to-idler conversion efficiency in the longer idler wavelength region. So as to increase the pump-to-idler efficiency, the research group led by Prof. Shining Zhu at Nanjing University, designed a tandem optical parametric oscillation and amplification (OPO-OPA) process and demonstrated an efficiency-enhanced ps mid-infrared radiation via optical parametric down conversion for the first time. The details of the study are reported in Chinese Optics Letters, Vol. 14, No. 4, 2016 (S.F. Li et al., Efficiency-enhanced picosecond mid-infrared optical parametric downconversion based on a cascaded optical superlattice). In this study, the quantum efficiency of the cascaded process can reach 200% in theory. Therefore, the energy of the pump light could be converted to the idler light in order to achieve a maximum conversion efficiency as high as 100%. This scheme can break though the quantum efficiency limit and have a wide field of applications where high power mid-infrared lasers in the ps region are urgently needed. In this experiment, only one certain wavelength can be further amplified in the OPA process. If a muti-grating or fanout grating structure is used in the OPA process, muti-wavelength amplification or wide bandwidth amplification will be achieved.